Grammy award-winning songwriter and producer Brian West, has come a long way since his humble beginnings in Thornhill, Ontario, a quiet, little suburb just an hour outside the cosmopolitan city of Toronto. Growing up, the West household was filled with the sounds of classic rock: The Beatles, The Stones, and The Who, all of whom began to shape his musical ear. Later, he and his childhood pals began a deep exploration into soul, jazz, funk and eventually hip-hop. His first band, The Philosopher Kings, was heavily steeped in jazz. Founded in the early ‘90s, “when everyone else was still really into Nirvana and the grunge thing,” West and his college art school friends got really into bebop. “It was our way of being rebellious,” he recalls. With West on Rhythm guitar, the band won the 1996 Juno award for Best New Group and toured with international heavy hitters like The Fugees, Jamiroquai, Kool & The Gang, Maxwell and their idol, Al Green. In 1997, West and bandmate Gerald Eaton yearned to stretch their musical boundaries. Where the group had been making music with a retro-jazzy sound, West and Eaton wanted to make modern music. “We wanted to play with these new toys that everybody else was using,” says West. This was about the time they met a young Nelly Furtado, who turned out to have exactly the voice they needed for their experiments. Furtado became the flagship project under the pair’s newly launched Track & Field banner. And several of those first songs that West and Eaton wrote and produced together landed on Nelly’s multi-platinum debut, including “I’m Like a Bird”, “Hey Man,” “Party Just Begun” and “My Love Grows Deeper Everyday”. West had no idea that the Whoa, Nelly! album, an eclectic pop record with sounds from all over the map, would hit as big as it did. 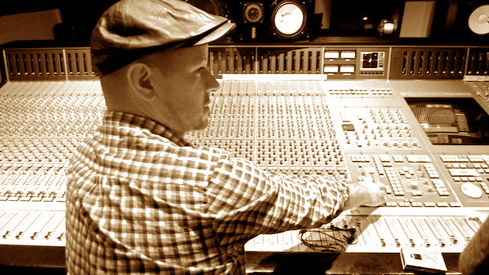 In addition to multiple Juno awards, Track & Field garnered the esteemed 2002 Grammy nomination for Producer Of The Year for their work while Nelly won the Grammy for Best Female Pop Artist. “Nelly’s international sound really resounded with a lot of people all over the world, which is good, because people tend to be a little more open minded in different markets”, says West. Not surprisingly, a diverse range of legendary and contemporary super talents such as Steve Perry, Tina Turner and Ricky Martin sought out the skills of the powerhouse production duo. The awesome twosome also honed a considerable amount of new talent. One of those newcomers included rapper K’Naan. In 2002, Eaton met the Somali hip-hop artist through a War Child Relief project out of Toronto. Track & Field created the perfect sonic backdrop for the African wordsmith, catapulting the young artist to the top of the heap in hip-hop. West later worked at the legendary Tuff Gong Studio in Kingston, Jamaica to produce K’Naan’s critically acclaimed sophomore album, Troubadour which went on to receive the ‘Best Newcomer’ Award from the BBC. Country, God Or The Girl, K’Naan’s forthcoming album features a guest turn from Bono on the West produced track, “Bulletproof Pride”. For the last three years, he has been developing and producing artists on his own, sometimes under the moniker “Sweet Westy,” a nickname he picked up years ago on the road. Development is the one thing he feels he has had the greatest success at in his career. “I just love finding somebody at an early level, helping them figure out what their voice is and discovering how to capture that on a microphone or on a recording,” he explains. Over a decade after his initial success with Nelly Furtado, Sweet Westy has come full circle. In addition to contributing to her 2010 Latin Grammy-winning Spanish language album, Mi Plan, the multi-talented musicaneer has unwittingly found himself right back on stage playing guitar in her band. “I never thought at 40 years old I’d be in a rock band playing some of the best gigs imaginable,” he laughs.